Last night Stu, Ollie, Toby and I went to see The Last of the Haussmans at the Lyttelton Theatre part of The Royal National Theatre on London's glitzy South Bank. 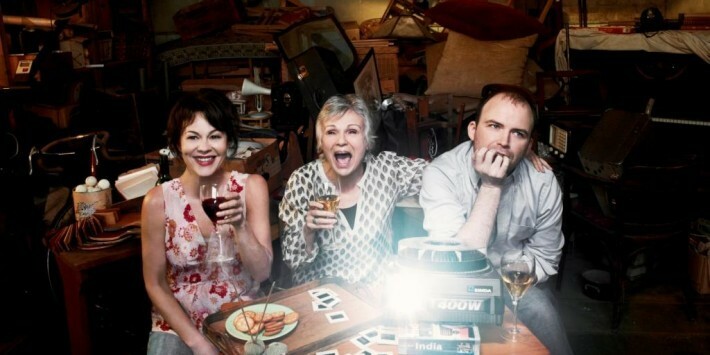 The Last of the Haussmans is a new play by Stephen Beresford starring Julie Walters as the anarchic, feisty but growing old, high society drop-out Judy Haussman who holds court in her dilapidated Art Deco house on the Devon coast. Rory Kinnear and Helen McCrory play her wayward offspring. After an operation, Judy Haussman’s joined by said offspring Nick and Libby, sharp-eyed granddaughter Summer, local doctor Peter, and Daniel, a troubled teenager who makes use of the family’s crumbling swimming pool. Together they share a few sweltering months as they alternately cling to and flee this louche and chaotic world of all-day drinking, infatuations, long-held resentments, free love and failure. The play examines the fate of the revolutionary generation and offers a funny, touching and at times savage portrait of a family full of longing that’s losing its grip. The three main cast were excellent. The play is a little baggy though. Maybe it'll tighten up through the run. "The only thing to be in life is a rebel." "Let’s show this younger generation what it’s all about! Shall we get naked?"